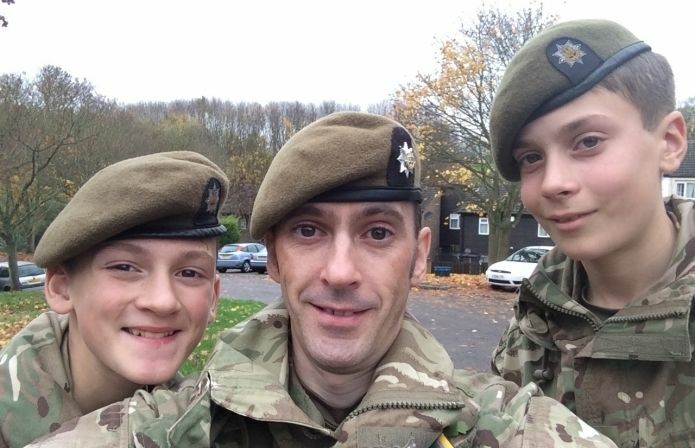 2nd Lieutenant Simon Crossley's stories of action and adventure as a volunteer in the Army Cadet Force inspired his two boys to join the Cadets as soon as they could. My son, Taylor, aged 14, has had an interest in the ACF since he was crawling as I would take him along to family days or open events where I could and since living with my step son, Joshua, aged 13, he too developed a keen interest in joining. Both of them couldn’t wait to attend when they started in year 8 at school. Taylor and Joshua are proud that I am in the ACF and now enjoy telling me about what they have been up to with the cadets of an evening or during their weekends away. I have been able to see first-hand the benefits the boys have got through the ACF. They have both increased in confidence, met new friends and have developed the ability to speak more freely in front of groups of people meaning they feel more comfortable to put their hand up in the school classroom and answer questions. Both Taylor and Joshua were also recently promoted to Cadet Lance Corporal through demonstrating some of the leadership skills they have leant since joining the ACF. I mainly spend my evenings volunteering at LNR ACF visiting detachments as part of the county HQ team in Leicester, although do sometimes get the chance to spend extra quality time with my sons at their detachment in Northampton or during annual camps. For me having a common interest with my teenage sons is great, as it gives us something we can all talk about without anyone losing interest. I would certainly encourage other dads to find out more about joining the ACF, as I have gained so much from the experience personally as well having the chance to spend the extra time with my family. One of my proudest volunteering achievements is training as a First Aid Trainer and Assessor, as I know these are valuable skills that could be utilised in or out of the ACF environment. As well as being the county PR Officer for LNR ACF, Simon works full time as an Application Support Analyst in Travis Perkin’s IT department in Northampton and is now also in the process of volunteering to help East Midlands Ambulance Service as a Community First Responder.